We went out to visit friends this past Monday and had a great time. Dinner was great, we exchanged a few presents, and A even let herself be held by someone other than her parents. Trish, our hostess, makes fabulous cakes and cupcakes. (You can find her work here). She passed along a few mini cupcakes to us so we could celebrate A’s birthday with some yummy homemade goodies. After lunch, I decided to see what A thought of her cupcakes, and put one out for her. She considered it for a moment, and then started crying. I immediately removed it (What else could I do? I ate it.) and she calmed down. Kids have weird things that set them off, and cupcakes are apparently one of A’s. 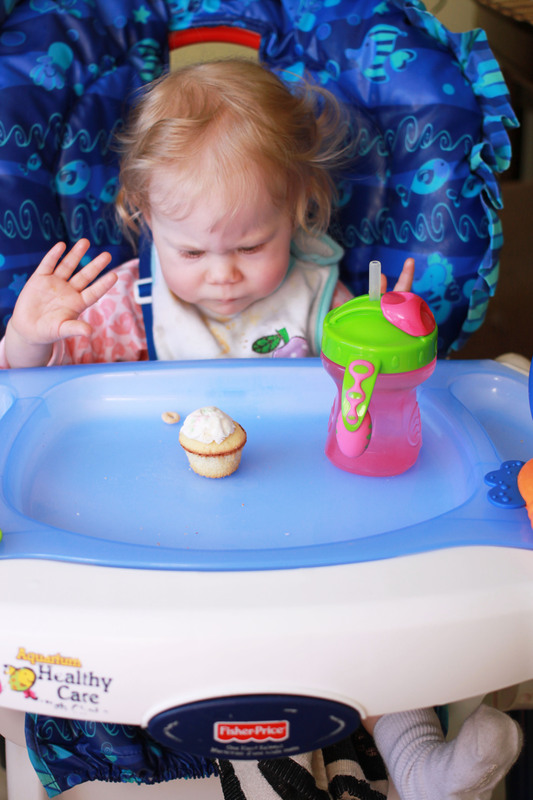 This entry was posted in Food and Nutrition and tagged baby food preferences, birthday cupcake, cupcakes on January 2, 2014 by lovelaughlaundry.